Gleeson’s imaginative play-calling is going to lead to some fascinating concepts at OSU. I am convinced that if there is a pie chart of why Mike Gundy hired new offensive coordinator Sean Gleeson, it would look like this. It’s true that Gleeson will play two (and sometimes three!) 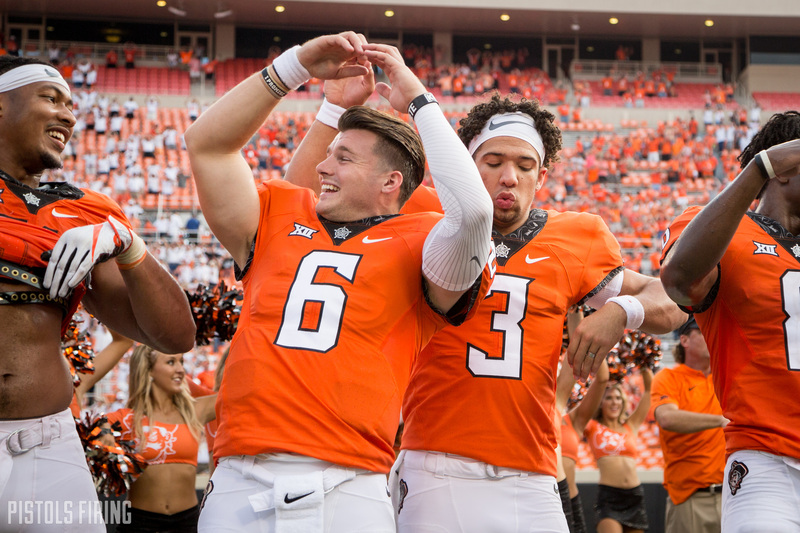 QBs at the same time on the same play, which means that a year after begging to see either Spencer Sanders or Dru Brown, we might see both on the field during the first play of the 2019 season. “It seems like it was mostly red zone,” said Bill Connelly on our podcast on Tuesday. “Which makes perfect sense. You’re just trying to wrong-foot a defense for a half second, and that’s really maybe all it takes to get into the end zone. It remains to be seen whether this is something that can work in the much faster Big 12 (I would imagine the gap between defensive speed is much wider from the Ivy League to the Big 12 than the gap between time it takes to release the ball). However, OSU could use a red zone boost when it comes to scoring touchdowns. Here’s a look at where they’ve ranked nationally over the past few years. The numbers aren’t bad — and they’re actually better than I thought they were — but for a top-20 or top-15 offense in terms of yards per play and explosiveness, they need to be better. Of course the flip side of this is — as one of our writers pointed out — that the last time Mike Yurcich tried to play two “quarterbacks” at the same time, it ended with a horrific loss at home to TCU. Jalen McCleskey wasn’t an actual quarterback, though, and I’m fascinated to see how (or if) OSU employs some of these tactics used by James Perry, who Gleeson studied under and succeeded as the offensive coordinator at Princeton. Here are some delicious clips from 2013 when Perry was the OC and Gleeson the running backs coach. For 8-12 plays a game, or just 10 percent of the team’s average 90 plays per Saturday, Princeton lines up quarterbacks Bostic, Epperly, and Connor Michelsen on the field in some formation. The plays are run within the flow of their no-huddle offense. The visuals can be borderline absurd. There is the play where Michelsen lines up in a pistol formation, with Epperly to his right, then hands off to Epperly, who rolls left and throws on the run to Bostic, who had been motioned out wide to become a receiver. Amazing. But here’s the money paragraph that has to just make Gundy’s knees weak. While certainly unique, (Princeton head coach Bob) Surace says that what Princeton does now is not greatly different philosophically from its past. He harkens back to the teams under the direction of Charlie Caldwell, a famed coach at the school and under whose name the position is now endowed. Anyway, Gleeson talks at length about why Princeton did the multi-QB thing and how it all worked in the video below. It’s actually a pretty fascinating concept that has me convinced it could actually work as more than a flag football gimmick with Brown and Sanders (and Costello?!) in 2019. The more I learn about Gleeson and the more I learn about the folks he studied under, the more intrigued I am. This hire might not be revolutionary, but it at least shows that Gundy is willing to flirt with risk more than most. And when you recruit like OSU currently does, risk is what keeps you relevant.